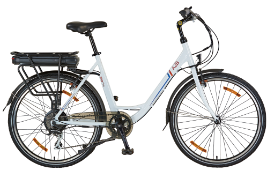 A2B bikes are some of the most international bikes we’ve come across! Utilizing the highest quality components from China, constructed and extensively tested in Germany before finally being distributed from right here in the UK. A2B bikes are real workhorses: robustly built, extensively tested and using unfaltering components. Perfect for anyone looking to explore the urban jungle. Of course, they’re gorgeous to look at too!